Click under your name in the header bar. NOTE: The in the bottom right-hand corner of the screen will also notify you that there are product updates to be reviewed. The Dashboard Module provides you with quick-select options to view metrics, manage the initial setup of your database and follow your success plan. The Getting Started tab provides a list of the Key Setup Steps. 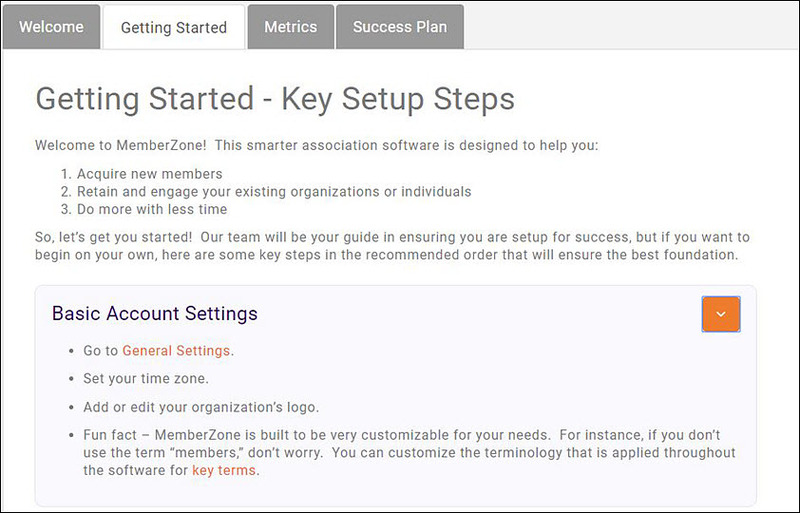 These are some key steps in the recommended order that will ensure the best foundation as you begin working with your GrowthZone software. Click on the arrow for each step to see the instructions for that step. For Example, the steps for you Basic Account Settings are shown below. Links are provided to allow you to easily navigate to the functions. NOTE: NOTE: Click Here for detailed instructions on completing the getting started tasks. The Metrics tab displays a variety of charts and metrics providing an at a glance view of your organization. Click Move Widget. This will enable you to move all of the widgets into your desired placement. Click and hold down on the icon. You can now move the widgets where you wish to place them on the dashboard. Click the Done button when you have completed your arrangement. Click the Add Widgets button. Select the widget you wish to add. The widget will be added in the top left hand side of the dashboard. You will configure your time zone and organization logo as one of the first steps in using your database. NOTE: The General Settings logo is the main default logo. A separate logo for invoices may be uploaded in the Finance section. Click Here to learn how to configure your logo for invoices. Click Setup in the Navigation Panel. In the Miscellaneous section, click General Settings. Select your time zone from the Current Timezone drop-down list. Select your locale from the Culture list. This will customize dates, times and currency to your locale. Primary Logo - Click the pencil icon below Primary Logo to import your logo. The Image Manager window will open. In the Image Manager, click Upload. You will then navigate to your computer/server location of your logo. Select your logo and click open. You may position and crop the logo as needed. Click Crop and Save to save your logo. NOTE: The pencil icon will only display when you hover your mouse below Primary Logo. GrowthZone is built to be very customizable for your needs. If needed, you can customize the terminology used in the database. For instance, if you wish you may change the default name "Organization" to "Business". In the Miscellaneous section, click System Terminology. A list of terms that may be customized is displayed. Click the link for the term you wish to customize. The Override Terminology screen will be displayed. Enter the term you wish to use in the Your Custom Term text box. Enter the plural version of your custom term in the Plural Form text box. Click Done to save your changes. Custom Fields are designed to give ultimate flexibility in managing your data. When adding a custom field, you will create a database field that is available for tracking additional desired information. For example, you may wish to track an individuals birth month so that you can send out birthday greetings. Fields may be added to your Member Application Form to capture the information at the time of application, or fields may be added directly to a record. Click Custom Fields in the Miscellaneous section. A list of the custom fields currently configured in your database will be displayed. Field Area - Select a field area from the drop-down list. This selection dictates where you would like to use the custom field. For example, if you wish to create a field to be used in your Web Content, you would select Content Item. Name - Enter a name for the custom field. This will be used internally by the database. Display Name - Enter a display name. This is the field that will be displayed to the public. For example, if you are creating a "Meal" field for selection of a meal choice on an Event, you may wish the enter "Please select your meal choice" to be displayed to the public. This field may include a question or statement, as needed. Custom Field Data Type - Select the data type for the custom field. NOTE: Selecting Drop-down will allow you to setup a list of options, and one option may be chosen. Selecting Drop-down with fill-in will allow the user to fill in an option. Multi-choice would allow the user to select more than one option. Group/Section - (Optional) Select the desired group section of this custom field. Group sections are used through-out the software, and you may wish to group together similar custom fields. Characters Allowed - This option would limit the number of characters that could be entered in a text box response. If you have selected a text box option (text or multi-text) you MUST enter in the number of characters allowed, and the value may not be 0. Public - Select this check-box if you wish this field to be displayed for the public. This will allow the field to be displayed in the InfoHub, Directories and fur use in membership applications. 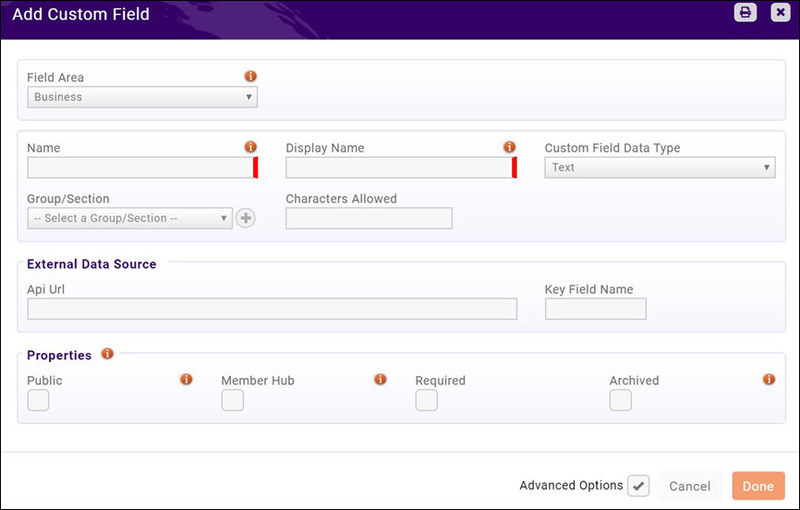 Member Hub - (Advanced Option) Select this check-box to allow users to edit this custom field in their hub profile. If a custom field is to appear in the hub, but is not to be editable, you need only check the property Public. Required - (Advanced Option) Select this check-box to make this field required. Archived - (Advanced Option) If you no longer wish to use this custom field, selecting this check-box will hide the field from being used in the back office, but historical data will be maintained. 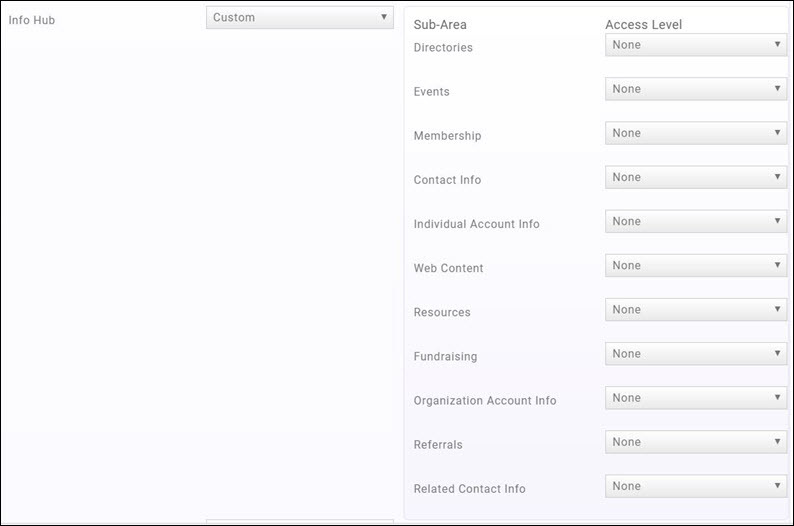 When your database is first installed, your organization is added as a contact with non-member status in the database. Review the contact information to ensure all address information and email are correct. The data populated is the information provided to GrowthZone initially, and you may edit as needed. Select Contacts in the Navigation Panel. Enter the name of your organization in the Search box. Click the hyper-link for your organization. On the Profile tab, review your organization information in the Contact Info section. If editing is needed, click the pencil icon to open the edit dialog box as needed. NOTE: Country must be selected when entering address information. If country has not been selected, drop-down lists for picking states will not be available to you in such things as the membership application form, registration for events, etc. Your organization exists as a contact in the database. If address, web-site, phone, emails, etc. need to be updated, see Update a Contact Organization/Business Profile Information. If you are re-branding your organization with a new logo, you can update your logo under your organization's information. Click your logo in the header. Upload your new logo, and Crop & Save. NOTE: If you have also included an alternate logo for your invoices, update the logo in the Finance Settings. See Configure Finance Defaults & Logo for Invoices & Statements for further information'. Access to the database and to the Info Hub are "access level-driven". A staff or members may only view, edit, delete and/or create based on the Access Level they have been given. Access Levels drive what functions your staff will be able to perform in the database. You may view existing access levels by selecting Setup in the Navigation Panel, and clicking Access Levels in the Users section. Staff - Admin - this access level provides full control of the entire database. Individuals with this access level will be able to view, edit, create and delete. Staff - Guest - this access level provides read only access in the database. Staff - Standard - this access level provides read/edit/create/delete of the system, with the exception of the Finance sections, which are view only. Staff - Finance - this access level provides full editing, and full Finance access. Staff - Website - this access level allows the staff user to ONLY edit or login to the website (by clicking the globe icon in the header bar). All other areas of the database are set to None. User - View Only in Info Hub - this access level provides view only access in Info Hub. User - Create/Edit/View in Info Hub - this access level provides Create/Edit in Info Hub but not the ability to delete. User - Full Control in Info Hub - this access level provides full control in Info Hub. Users with this access can view, add, edit & delete. The above access levels may be used as initially setup, or you may customize them to meet your needs. NOTE: Click here for information on setting up your member's access to the Info Hub. In the Navigation panel, select Setup. Click the Access Level link in the Users section. 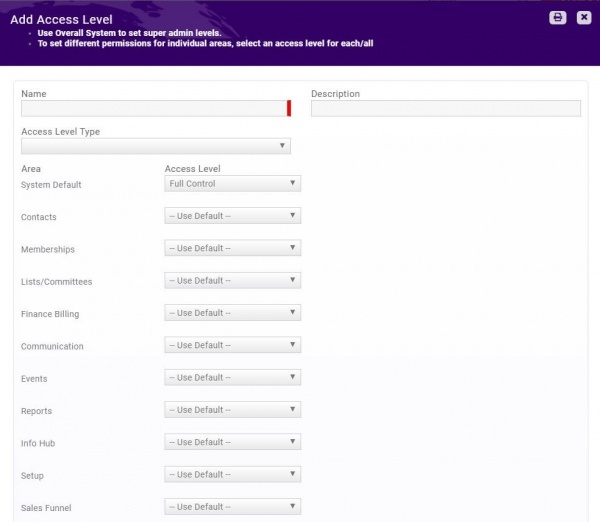 The Access Levels screen will display a list of the pre-configured Access Levels, and the number of people assigned to each level. You may view the permissions that are associated to a particular level by clicking the hyper-link. You will see a list of each of the main functions of the database, and the access level granted. The Users column displays the number of users assigned to the access level. To view a list of the users click the numbered hyper-link. Enter a Name for the new Access Level – best practice would be to provide a name that at a glance tells you what the access level is for. Select the Access Level Type. Select Staff. The Staff and User options are a way for the system to differentiate between which access level it should display when you are creating access for a member of your chamber or association vs. creating access for a staff person. For each function, select the level of access you wish to provide. If you wish to provide access to the entire system with one level of access, you can do this by selecting the access level for System Default. Or, if you wish to set specific access to individual functions, select the access for that function. Once all selections have been made, click Done. View: This access level allows the user to retrieve and view information from the database in read only mode. Edit: This access level allows the user to retrieve and change/update existing database information. Create: This access level allows the user to add new content to the database, as well as view and update existing information. Delete: This access level allows the user to remove existing content from the database as well as create, update and view. Full Control: When this access level is selected the user will be able to delete, create, update and view. Use Default: When this access level is selected, the user will be given the access level selected in System Default. None: By selecting this option, the user will have no access to the specified area. NOTE: If you set the access to the overall system - this setting will apply to all modules, unless you have specifically set access levels for some of the modules. The module level will supercede Use Default the System Default. If you do not set the System Default, you must select access level for each and all modules. If you select Use Default the System Default setting will apply. If you select None this will be applied and the user will have no access to a particular module. Click Access Level in the Users section. 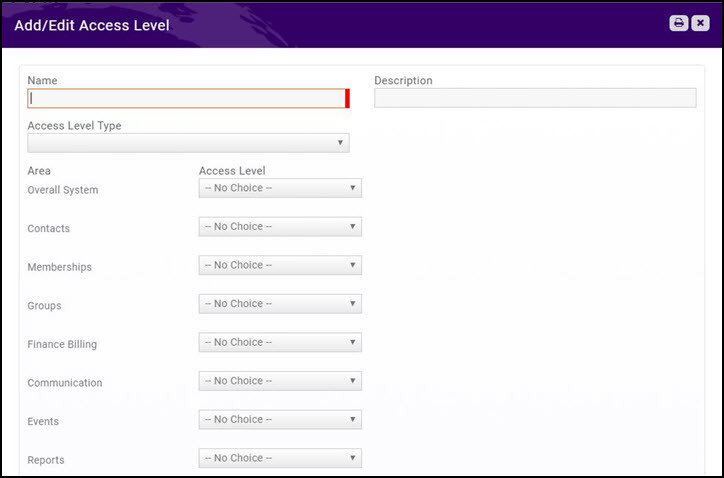 The Access Level screen will display a list of the pre-configured Access Levels, and the number of people assigned to each level. You may view the permissions that are associated to a particular level by clicking the hyper-link. You will see a list of each of the main functions of the database, and the access level granted. The Users column displays the number of users assigned to the access level. To view a list of the users click the numbered hyper-link. Select the Access Level Type. Select User. The Staff and User options are a way for the system to differentiate between which access level it should display when you are creating access for a member of your chamber or association vs. creating access for a staff person. For User (Member) access, scroll to Info Hub in the Area list. 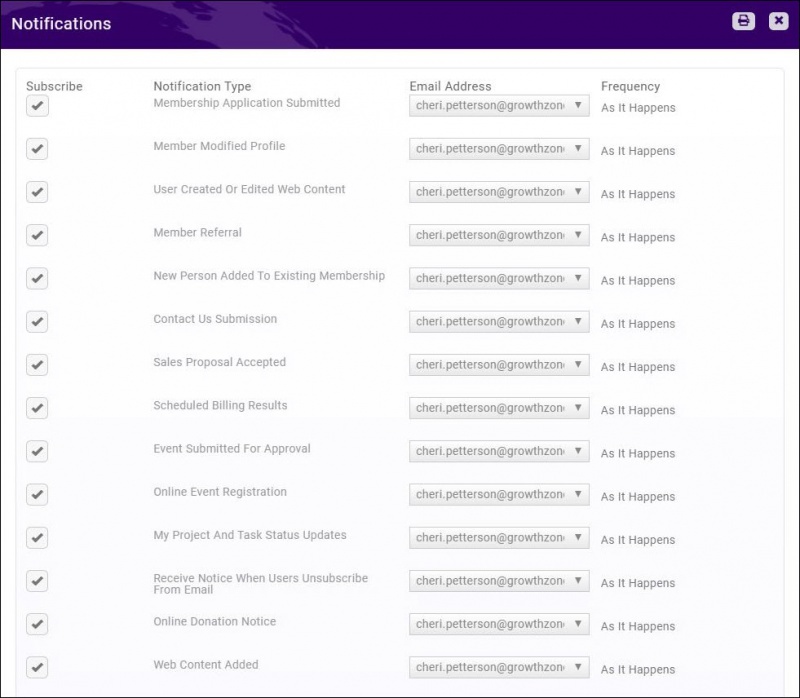 Click Custom to display a list of all areas in the Info Hub to set specific access to each area. For Example: you may wish to setup an access level that provides an individual access to update and manage their own account information, but not the organization account information. In this case, you would set Individual Account Info to Edit and set Organization Account Info to None. Or, if you wish to hide certain items from this access level, for example Resources, you would set Resources to None. NOTE: If you set the access to the overall system - this setting will apply to all modules, unless you have specifically set access levels for some of the modules. The module level will supersede the overall system level. If you do not set the overall system, you must select access level for each and all modules. If you select None the menu option will not be displayed in the Info Hub Navigation panel. Contact Info: This tab displays contact information for the individual logged into the Info Hub. Access to this is controlled by the Contact Info setting. Membership: This tab displays the individual's membership, and is controlled by the Membership setting. However, if the individual does not have access to the Organization Account Info the pricing information for the membership will not display. Account: This tab displays billing information. You can control an individuals access to individual billing and organization billing information by the Individual Account Info and the Organization Account Info settings. Note also, a user must have at least View rights to store and edit credit card information. Related Businesses: The Related Business tab displays the business (organization) to which the individual is related. An individual with appropriate access may update company information, etc. on this tab. This tab is controlled by the Related Contact Info setting. Related Contacts: This tab displays the individual contacts associated to a business. This tab is controlled by the Related Contact Info setting. Refer Others: This tab is controlled by the Referrals setting. The display of the tab and the ability to refer others is controlled by whether this setting is set to Edit or None. Each member of your staff who will need access to the database will need to be provided with login credentials. In the Navigation Panel, click Setup. Click Staff Users in the Users section. A list of all active staff in your system will be displayed. 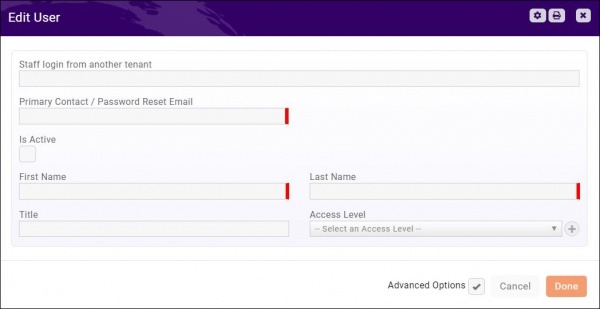 Primary Contact / Password Reset Email - Enter an email address for the user. This email address is used to send an initial email to the user to complete their login credentials, and is also used when an email needs to be sent to reset a password. Access Level - select the access level you wish to assign to this user. An email will be sent to the staff member. Within the email is a link to create their account. The link is valid for 72 hours. If they do not create their credentials in the 72 hour window, they will receive an error. In this circumstance, you would need to resend the log-in setup email. In this circumstance, you can resend the instructions email. Click Here for further information on resending instructions. NOTE: If the new user already exists in the database, the system will display this on the screen, this will prevent you from creating a duplicate user. Click Staff Users in the Users section. A list of all of your staff users will be displayed. When a new user is setup in your system, an email is automatically sent to them to create their user name and password. If a user does not receive notification to setup credentials, or they have not setup their credentials, you can resend the setup instructions from the Users page (Setup > Users > Staff Users). Click the Resend Invite icon in the Actions column. Click the Send Reset Email icon in the Actions column. NOTE: If multiple staff members use the same e-mail address, each will receive the reset password email. Within the email a link in the email to each associated account is provided. For Example: If Betty and Sue both use the email address info@mychamber.com but each have their own login name to the tenant. Betty asks for a password reset email and when it arrives she knows which reset link to select because it is identified with the login name that she is used to using. You can reset a users password on the Users page (Setup > Users > Staff Users). Click the Reset Password icon in the Actions column. You may disable the login for a user, without deleting the user. This function may be useful, for example, when someone is out on leave. By disabling the log-in, the username and log-in will be reserved for this staff user which will make it easy to re-able the user as needed. If you wish to completely remove the staff member from your database, see Delete a Staff User. Click the Disable Staff Login icon for the desired user. You will be asked to confirm that you wish to disable this user's login. The status of this user will now be displayed as Not Active. The user will no longer be able to login to the database. If they attempt to log-in the Account is disabled message will be displayed on the log-in screen. NOTE: If the staff person is also a member of your organization, who wishes to setup access to the Info Hub, he/she will NOT be able to use these same credentials for access to the Info Hub. Click the Enable Login icon for the desired user. You will be asked to confirm that you wish to enable this user's login. Select the Is Active check-box. The status of this user will now be displayed as Active and the user will be able to use the same user name and password used previously. Unlike disabling a login for a staff user, when deleting a staff user, you will release the username and password associated to the user, and not have the ability to re-enable the log-in. If the staff member is also a member of your organization, he/she may wish to use their staff credentials to access the Info Hub. In this case, best practice would be to delete them as staff. If you wish to simply disable the login for the staff member (perhaps he/she is on leave) best practice is to disable the login, so that you can easily re-enable when he/she returns. If you delete the user, you will need to add them back to the system, and re-create login credentials. See Disable Staff Login for further information. Click the hyper-link for the staff user you wish to delete. Click the Delete button. You will be asked to confirm that you wish to delete this staff user. Your system can be automated to send notifications when certain events occur. For Example: An automated notification can be sent to a staff member when an On-line Membership Application is submitted. The table below describes the message to which staff may subscribe. Membership Application Submitted An email notification will be sent when a new membership application form is submitted. Within the email, a link is available to access the applicants contact page to review the applicant information. Member Modified Profile An email notification is sent when a contact modifies profile information via the Info Hub. User Created or Edited Web Content An email notification is sent when a contact adds web-content, or changes existing web content via the Info Hub. Member Referral An email notification is sent when a contact makes a referral via the Info Hub. New Person Added to An Existing Membership An email notification is sent when a new rep is added to an existing membership, either via the Info Hub, or from the back-office. Contact Us Submission An email notification is sent when a new Contact Us form is submitted. Sales Proposal Accepted An email notification is sent when a prospect accepts a sales proposal via the on-line link. Event Submitted for Approval An email notification is sent when a contact enters an event via the Info Hub. Within the email is an Approve Event link. When clicking the link, if you are currently authenticated in the software (logged in), you will be taken to the event's Overview tab. If you are not currently authenticated in the software (not logged in), you will need to log-in and navigate to the event's Overview tab. See Approve Events submitted by Members. Online Event Registration An email notification is sent when someone registers for an event via the on-line registration page. Membership Renewal Response Submitted For memberships using Renewal Notification only. This email will be sent to staff when a member accepts or declines renewal of their membership. Renewals Emails Sent For memberships using Renewal Notification only. This email will be sent to staff when the initial renewal emails are sent out to members. New Certification Enrollment This email notification is sent when a Contact selects to enroll for a certification via the HUB. New Certification Application This email notification is sent to the Staff when a Contact selects to apply on a certification in the Info Hub. Member Completed Certification This email notification is sent when a contact completes all requirements for a certification, and the status of the certification is changed to Active. Invoice Payment Received This email notification is sent when an invoice is paid on-line. Auto Payment Failed This email notification is sent when a payment scheduled for auto-payment fails. Forum Topic Added This email notification is sent when a new topic is added to a Forum. Forum Topic Comment Added This email notification is sent when a new comment is added to a topic in the Forum. An administrator can setup the notifications for a staff member on the Users page (Setup > Users > Staff Users). Click the Notifications icon in the Actions column. Click the notifications to which you want to subscribe this user. Select the users email address. Select how frequently you want this user to receive notifications: As it Happens or Daily. 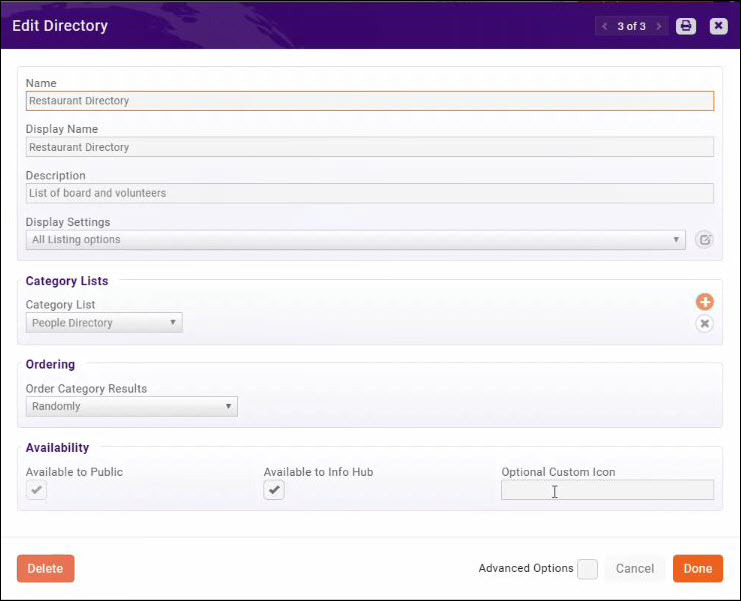 Directory Categories allow you to categorize your users effectively in your business directory. Select Setup in the Navigation Panel. Click Category Lists in the Categories section. A list of all categories will be displayed. By default your system is populated with the Contact Business Category. These business categories are available for selection when assigning your members to directory categories. Click the Business Category hyper-link. A list of internet standard directory categories will be displayed. New top level categories (those that appear in bold in your active directory) or sub categories may be added to your directory. To add an individual category, click the Add button. Name - Enter a name for the category. This is the name that will appear in the active directory. Description - (Optional) Enter a description of the category. Color - Select the color to highlight this category. Parent Category - (Optional) Select the parent category. If a parent category is selected, your new category will be displayed below the parent in the active directory. If no parent is selected, the new category will be a top level category shown in bold in your active directory.NOTE: This option is visible when you enable the Advanced Options. To add multiple top-level categories, click the Add Multiple button. Names(Line By Line) - Enter each category line by line. This is the name that will appear in the active directory. Parent Category - (Optional) Select the parent category. If a parent category is selected, the new categories will be displayed below the parent in the active directory. If no parent is selected, the new categories will be a top level category shown in bold in your active directory. 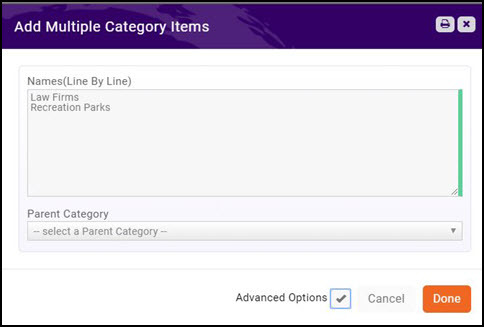 You may select only one parent category for all the new categories you have listed. NOTE: This option is visible when you enable the Advanced Options. Click Directory Display Settings in the Website section. 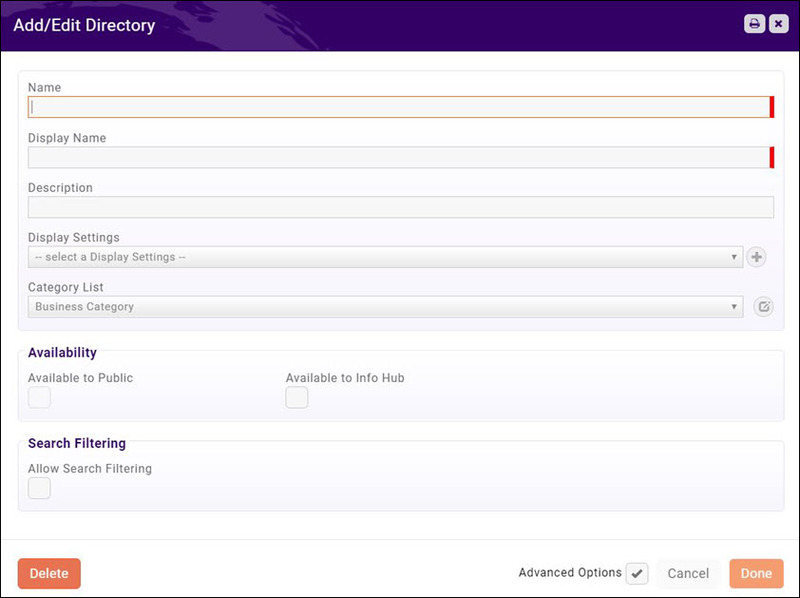 A list of the Directory Display Settings currently configured in your system will be displayed. NOTE: Standard Listing and Deluxe Listing are seeded into your database by default. The Standard Listing is used as the default when you create Membership Types. Name - Provide a name for the Directory Display Settings. Description - Provide a description of the Directory Display Settings. Rank/Priority Placement - This setting allows you to dictate where organizations that are assigned to this directory listing this will be displayed the directory. Entering a value of 1 will place at the top of the directory, entering a value of 255 will place at the bottom of the directory. Show Individual Details - These settings are used for individual based memberships. Select which details for your individuals will be displayed when this directory display setting is used. Show Custom Fields - Select the custom fields you want to display in the directory. The drop-down list will display the fields that have been configured for Directory Listing. Options: Select additional display options. 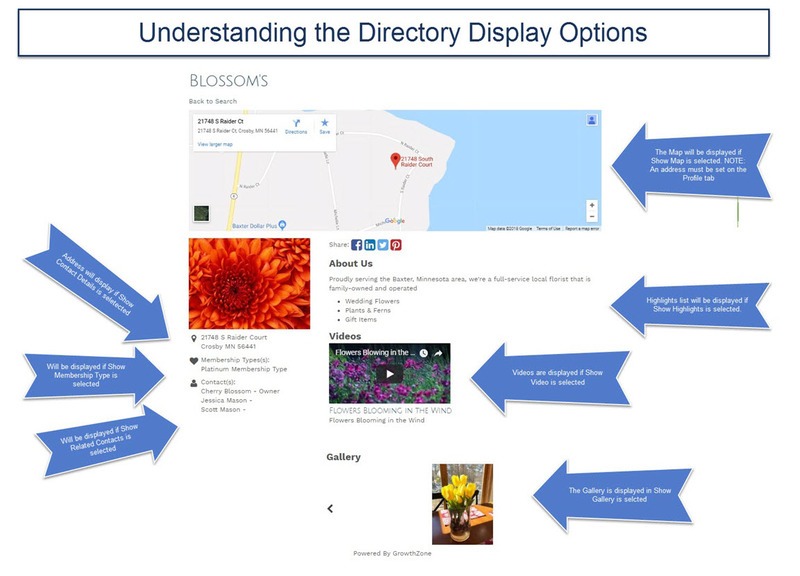 To see how your selections will impact the display in your activity, see Understanding the Directory Display Options. Show Membership Type - If selected the member's membership type will be displayed in the directory. Show Search Logo - If selected the member's primary image will be displayed when the directory is searched. Show Highlights If selected, a highlights section will be displayed on the web-page. Show Related Contacts: If selected, contacts related to the organization will be displayed on both the directory search results and on the organization's information page. NOTE: At the individual contact level a selection may also be made to include or exclude an individual contact from displaying on the directory. See Add Individual Contact for further information on configuring show related contacts individually. Show Search Description: If selected, and using V1 directory, the short description will be displayed in the directory list. If using the v2 public modules, this setting has no impact. Show Gallery: If selected, the member may display a gallery of photos on the web-page. Show Video: If selected, the member may display a video on the web-page. Show Map: If selected, the location of the organization will be displayed on map on the web-page. Show Primary Contact: If selected, the name of the primary contact will be displayed on the web-page. Use Contacts Website for Listing page: If selected, clicking on the member on your public web-page will lead to the contacts website, instead of your page. Applicable only when assigned to a public directory (not available in the Hub). Google Tag Manager Container ID - Enter the Container Id you were provided on installation of Google Tag Manager. Google Tag Manager is a free tool that makes it easy for marketers to add and update website tags -- including conversion tracking, site analytics, remarketing, and more—with just a few clicks, and without needing to edit your website code. Select the Distance option on the search page. 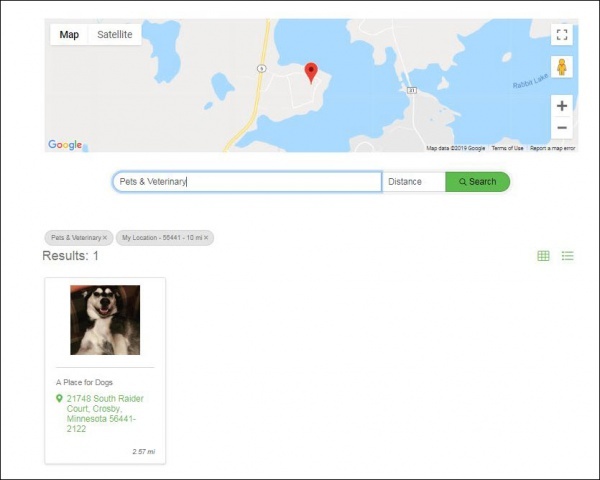 Enter a zip code, and select the distance (choices include 1, 5, 10 and 50 miles) from that zip code to narrow search results to a specific radius. The results will display the distance to the member locations. NOTE: If you wish to purchase the Enhanced Directory module, contact our sales team, sales@growthzone.com for pricing. The zip code search is only available in the US. The Enhanced Directory module is only available to those using V2 of the public modules. You system will contain a default directory, Active Member Directory. This directory is tied to your Business Category and may contain all of your valued members. It also is configured with the Standard Listing directory listing type. Advanced options, including searching by custom field may be configured for the default. You may create multiple directories as needed. For example, if you have several chapters, and want a separate directory for each chapter. Click Directories in the Website/Content Management System section. A list of the directories currently configured in your system will be displayed. Name - Enter a name for the directory. This is the name that will be displayed on your web-site. Description - Enter a description of this directory. This description will be displayed on your web-site. Select the Display Settings you wish to associate, by default, with this directory. You will have the ability to over-ride these display settings when creating Benefit Packages. Click here for more information on setting up benefit packages. You can view and/or edit an existing display settings by clicking the icon, or, you can configure new display settings by clicking the icon. Select the Category List to associate to this directory. You can view and/or edit an existing category list by clicking the icon, or, you can configure new category list by clicking the icon. Ordering: Select the desired Order Category Results. This option allows you to define how category results will be displayed in the directory. If Randomly is selected, category results will be displayed in random order. If By Name is selected, individuals are sorted by the first letter of their last name. NOTE: The Info Hub has it's own ordering options so randomization and ranking defined here are not applicable in the Hub. Availability: Click the Available to Info Hub check-box if you want to include this directory on the Info Hub pages and/or click the Available to Public check-box if you wish to include this directory on your public web-site. Optional Custom Icon You can now customize the icons you use for your directory(s) placed in the left hand navigation of the InfoHub, using Font Awesome icons. Enter the code for your custom icon. If you have multiple directories, this is a great way to differentiate them. For Example, if you wish to add a restaurant icon to a "Places to Eat" directory, you could enter the code fa-cutlery and the icon would be displayed next to your directory link in the InfoHub. Click Here to learn more about Font Awesome Icons. Click the Advanced Options check-box. Click the Allow Search Filtering check-box. 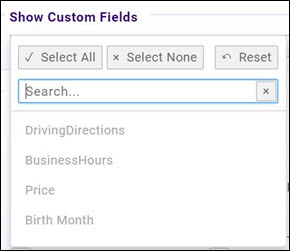 Click Search by Custom Fields if you want to allow searching based on custom fields you have created as Directory Listing. Existing fields will be displayed at the bottom of the screen. You can add additional fields as needed by clicking the + sign. You will then select the custom fields to be used for filtering from the Allow Filtering by Custom Fields drop-down list. Enable City, State and Postal Code if you wish to provide these as filtering options. To Allow Filtering by Category List(s), select the category lists you wish to allow search on from the drop-down. To Allow Filtering by Custom Fields, select the custom field you wish to allow search on from the drop-down. Your GrowthZone software contains a variety of templates for statements, invoices, badges, sales proposals and so on. These templates may be used as they are designed, or edited to meet your specific business needs. Click Document Generation Templates in the Document Generation section. A list of existing templates will be displayed. Click the copy icon for the template you wish to view/modify. Click OK in the confirmation dialog box. A copy of the template will be available in the list of templates. To view the template, click the pencil icon (Edit Template Document). The Open URL:Word Protocol dialog box will be displayed. Click Open URL:Word Protocol. You will be taken to the document editor login. 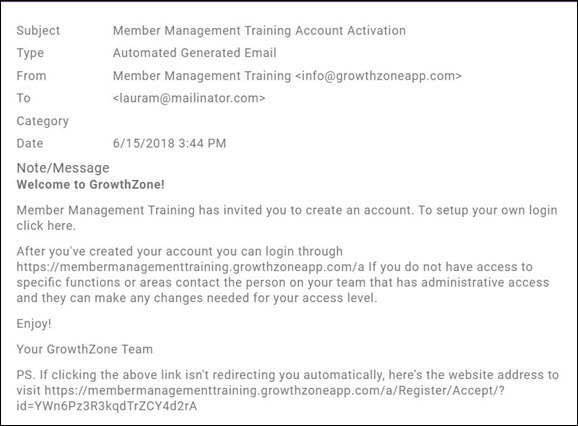 Enter your GrowthZone user name and password to launch the document. Enable editing of the document. Save your document.You can now choose this template where applicable. To edit the copy, click the download icon in the Actions column. Click Enable Editing and make desired edits. On the Document Generations Template screen, click the Add button. Enter a Name for the new template. Click Choose File to navigate to your saved copy and upload. Click Done. You will now be able to choose this template where applicable. Make a copy of the template as described above. Open the downloaded file as described above. Highlight & copy an existing merge field. Paste the merge field at the desired location in the document. Right click on the pasted merge field and click Edit Merge Field. Enter the name of the merge field you wish to add in the Field Name text box. The Field Name must be entered exactly as you see in the list below. After completing your edits, save the downloaded file, and upload to your database following the instruction above. When using merge fields on invoices, the system will look to the invoice(s) for the appropriate information to be included via merge fields. Many of the fields are included on the default invoice. Other fields may be added manually by editing the invoice. Fax This is the fax number for your association/chamber. WebAddress This is the web-site address for your association/chamber. PurchasedByNamePrimaryBusiness Purchasing Individual’s Primary Business (if applicable). BillToName Billing Contact Name (if applicable). BillToAddress1 Bill to Address 1. BillToAddress2 Bill to Address 2. UFPurchasedByContactPrefix Prefix for the contact who made the purchase. This is the ‘’’customer’’’. UFPurchasedByContactFirstName First name of the contact who made the purchase. This is the ‘’’customer’’’. UFPurchasedByContactMiddleName Middle name of the contact who made the purchase. This is the ‘’’customer’’’. UFPurchasedByContactLastName Last name of the contact who made the purchase. This is the ‘’’customer’’’. UFPurchasedByContactSuffix Suffix of the contact who made the purchase. This is the ‘’’customer’’’. UFPurchasedByContactCommonName Common name of the contact who made the purchase. This is the ‘’’customer’’’. UFPurchasedFromOrganizationName The organization from which the purchase was made (your association/chamber). UFBillingContactPrefix The prefix for the billing contact selected when the invoice was created. UFBillingContactFirstName The first name of the billing contact selected when the invoice was created. UFBillingContactMiddleName The middle name of the billing selected when the invoice was created. UFBillingContactLastName The last name of the billing contact selected when the invoice was created. UFBillingContactSuffix The suffix of the billing contact selected when the invoice was created. UFBillingContactCommonName The common name of the billing contact selected when the invoice was created. UFBillingContactName The full name of the billing contact selected when the invoice was created. UFBillingAddress1 The billing address selected when the invoice was created. UFBillingAddress1 The billing address 2 associated to the address selected when the invoice was created. UFBillingAddressCity The city associated to the address selected when the invoice was created. UFBillingAddressStateProvince The state or province associated to the address selected when the invoice was created. UFBillingAddressPostalCode The postal code associated to the address selected when the invoice was created. UFBillingAddressCountry The country associated to the address selected when the invoice was created. When using merge fields for cover letters, the system will look to the purchaser (customer) to whom you are sending the invoice to find the appropriate information. UFContactPrefix Prefix for the contact(s) to whom you are sending the invoice. UFContactFirstName First name of the purchaser(s) for whom you are printing the cover letter. This is listed as the customer when the invoice is created. UFContactMiddleName Middle name of the purchaser(s) for whom you are printing the cover letter. This is listed as the customer when the invoice is created. UFContactLastName Last name of the purchaser(s) for whom you are printing the cover letter. This is listed as the customer when the invoice is created. UFContactSuffix Suffix of the purchaser(s) for whom you are printing the cover letter. This is listed as the customer when the invoice is created. UFContactCommonName Common name of the purchaser(s) for whom you are printing the cover letter. This is listed as the customer when the invoice is created. UFContactName Full contact name of the purchaser(s) for whom you are printing the cover letter. This is listed as the customer when the invoice is created. Several Attendee Badge document generation templates are available for you to select for your event attendees. The fields listed below are available. Prefix Prefix of the event attendee. FirstName First name of the event attendee. MiddleName Middle name of the event attendee. LastName Last name of the event attendee. Suffix Suffix of the the event attendee. CommonName Common name of the event attendee. Click Setup in the left-hand navigation panel. Click Designations in the Miscellaneous section. Repeat steps 3 - 4 above to add additional designations. If you are an organization that manages multiple organizations that use the GrowthZone software, you can easily switch from one database to the next. Your staff members will need to have access setup in each of the databases, but will be able to use the same credentials for each. If your organization manages multiple databases, you can easily setup credentials for staff that will allow them to switch from one database to another. NOTE: One staff member must have Administrative access to any/all of the databases to perform these steps. Setup login credentials for all staff in your primary database, as described in Add Staff Member. Add all staff members as Individual contacts in each of the additional databases. See Add New Contact - Individual. Enter the staff user first and last names, along with email address. This should be the same as the names and email addresses entered in the primary database. Click Staff Access in the Users section. On the Edit Users screen, click the Advanced Options check-box. In the Staff login from another tenant text-box, enter the user name that was configured in the primary database. Enter the Primary Contact / Password Reset Email. This should be the email address that you entered for the individual contact, as well as the email address associated to this staff member in the primary database. If the contact exists in your database the system will automatically populate the First/Last Name fields. If you have not added the contact - return to step 2 and add the staff member as a contact. Select the Access Level that the staff member will have to this database. NOTE: Access level may differ from one database to another. In the list of staff members, click the icon in the Actions column. Click OK on the Enable Login screen. This will immediately enable the staff login for this database. NOTE: If changes are made to passwords, or staff members are disabled/deleted, these changes impact access to all databases. Click your name in the top right of the header bar. On the Switch Account screen, select the database you wish to switch to from the Default Tenant Key list. Click Done. The screen will refresh, and the selected database will be displayed. NOTE: The Switch Account option will only be displayed if the staff member has been setup for multiple accounts. At times, a member representative may need access to the back office to review information about the other representatives of their member organization. For example, if you have member representative who must review/approve certifications for other representatives of the organization. This would require access to the back office. In setting up access level to the back office in the following manner, the representative would only be able to view/manage information related to the other representatives of their organization. Add the representative, who requires access, to your Organization as a contact. See Add Individual Contacts to an Organization/Business for information on adding a contact to a business. Setup Access Level with Has Contact Relationship Restriction enabled. See Create a New Access Level - Member Contact with Back Office Rights (Members) for instructions. Add a staff login (Setup > Staff Login) for the member representative, and assign the access level created above to him/her. See Add Staff Member for instructions. On the contact's organization Profile tab, assign the individual to the organization as Assigned Staff. See Assign Staff to a Business/Organization for instructions. This page was last modified on 12 April 2019, at 05:53.